Well, considering I havent looked at this list since I wrote it.. I did fairly well! Here was the initial list. 1. Mother's Day Bags - this came as a special request from boyfriend's momma - fabrics are picked and I have all my supplies - done! 2. Puff Quilts - I have 3 of these I need to make by June - done! 3. Indie Quilt - Just need to baste and quilt this one - nope, no progress. 4. Hexie Snowflakes - make 50 more of these, I have 100 now, possibly start putting together - nope, I made 20 more, but not 50, and didnt start assembling either..
new prints to the MOVING SALE section of the shop! 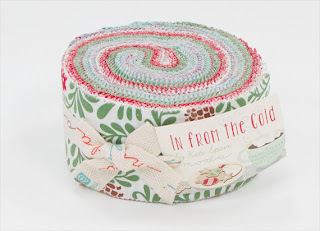 Including some In From the Cold jelly rolls!! but it will probably be around the middle of the month. Once I move, these prices will not be the same, so take advantage of them now! A few weeks ago I was contacted my Modern Yardage to see if I wanted to make something with their new fabric. Um, of course!! I've been eyeing up their lines through Instagram (@modernyardage) for some time now. I decided to go with their Garden Party line by Heather Dutton. I love these prints, they're so bright and cheerful, perfect for some summertime fun. I decided to use all medium prints in my fabric choices. I made some wine coasters with the coordinating prints. I know i'll be going to a bunch of barbecues this summer and these are perfect hostess gifts. 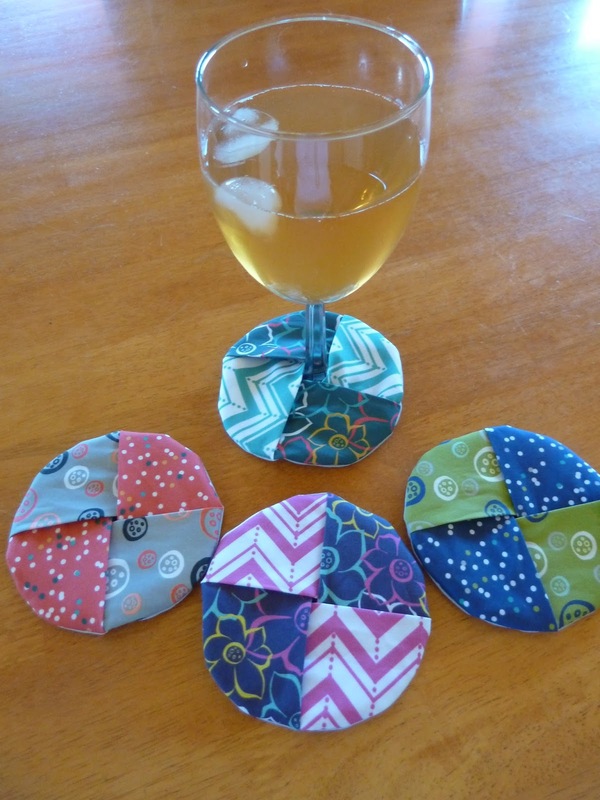 The colors are different enough that they can be used as wine glass markers (so you'll never forget which glass is yours) and coasters to protect delicate surfaces from any condensation. didn't see the slight wonk in this one until I cropped it... too late now, its already trimmed! Unfortunately i've packed up most of my personal stash and started shipping it home, so I'm leaving myself with scraps and hand stitching... it could be a long month of these blocks, and nothing new to show! Sorrryyyy! Don't forget to check out the Moving sale section in the shop, i'm continually updating! Perfect time to grab a few yards at really discounted prices for backings! Phew, finally caught up with my posts and blocks for this week... only to finish up the crosses section next week. Sorry for the bombardment of pictures! Enjoy your weekend, i'm off to finish the last 3!! Starting to get into those teeny tiny pieces now.. More time consuming, but still having fun! Does anyone else make 5-6 blocks at a time? I'd rather cut pieces for a bunch and then sew a bunch versus one by one..
but i'm making a dent in my serious scraps to make these, so really.. anything goes! I initially started these blocks out of order, then realized I needed to be posting in increments of three to keep up with the quilt a long! Whoops... So here goes..
Well, some of you may remember that big post last year, announcing our move to Hawaii?! Well... it's time to make the reverse trip! We've decided that although we immensely enjoyed this adventure, it's time to move home. Be sure to check back in as i'll be updating regularly! I'm off to organize some more.. wish me luck! So, it's Father's Day, but that means its totally acceptable to post about Mother's Day gift that I never shared... right??? Okay, so bags i'm getting better at, and hunting for a pattern I went. I finally decided on Anna Marie Horner's Art Student Tote. I opted for option B which had the additional extended top piece. there was a ton of material required so I didnt have much extra or room for error. First I made the pockets and the tie pieces..
Then super slowly lined up all the pieces and completed the lining.. The pattern claims that the pieces are marked. Mine werent. got some tips and pushed forward.. I'm in love, here it is with me holding it empty.. This bag definitely needs a redo, despite that it needs a ton of fabric I love the design, i'm thinking something QAYG style.. I decided to sign up for the Pillow Talk Swap on flickr after watching from the sidelines for many rounds, I was always astounded by the pillows I saw and really worried I wouldn't be able to create something "up to par" -- well, I took the jump and i'm so glad I did! I started stalking my partner and found this picture, I felt that it completely epitomized her requests for low volumes mixed with bright colors! So, I started pulling fabrics and got started on the squares.. I was a little leery of the "low volume" prints and I think that low volume is so subjective, but thanks to all my IG friends, I started feeling much much better and got back to work.. I decided to stick with some simple straight line quilting for this one.. I'm still eagerly and not so patiently waiting for mine to arrive!! 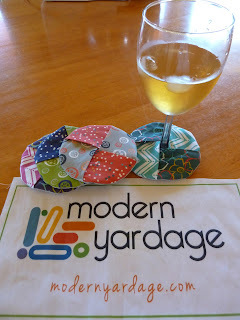 I also decided to link up my quilt from the Pillow Talk Swap 10 for Jennifer's Modern Mini Challenge! I realized the other day that I do a bunch of pop up sales through IG and Facebook, but what about the followers on my blog that maybe don't do the social media aspect of quilting.. so today, this ones for all of you! By Bonnie and Camille for Moda! Also let me know where I'm shipping to for the invoice! Well the parade of puffs is finally finished. I feel like all i've been working on for a month has been there dang puff quilts! I had a friend ask me to make one as a gift and then my brother requested 2 for his friend who was having twins! Of course I agreed, then promptly got caught up in other projects and forgot! All 3 babies were due this month.. dun dun dun. It started with puffs needing to be puffed..
Lots of broken needles and shredding of thread with these..
Off to Jersey it went. I used prints from Honey, Honey for the twins quilts, duplicating some of the blues and using the various colors of the same prints so that they were similar, but still two distinctly different quilts. Then finally, all 3 were finished. This is the only picture of the twin quilts I took together. Honestly, I was so tired of looking at them i'm lucky to have gotten this one. All three are winging their way to Jersey to be met by 3 little babies that have all been born already! I'm sure many of you know Danny from Mommy for Reals, and if you don't -- you need to stop by now. She's this amazing lady that is looking for some help with a teen camp for kids in the foster care system she and her husband help out with every year. Last year I had the privilege of helping out with her cause and each of the 40 girls that attended went home with their own personal pillowcases and zipper pouches. They loved it!! She's asked the blogging community for some help making drawstring bags for teen boys, and zipper pouches and pillowcases for teen girls that attend this camp during the summer. Whatever people don't sign up for... Danny makes herself, from her own fabric/personal funds to make sure each of these teens going has something that will be theres to keep. Danny needs these items shipped to her by June 30th! That's soon! So really, go sign up, take an hour out of your night, and make a difference for these teens. She's got links to the sizes, etc on her blog. I'll be back this week with some sewing finishes, but this cause took precedent this week for me..